You need a large steel cage trap, and you need to place it in the exact right spot. No bait will lure in an armadillo, because they only eat live worms and grubs dug out of the ground. Set the trap on armadillo pathways or on top of burrows, and they will actually just walk right in. There are actually very few preventative measures for the armadillo, and catching the not quite so little critter with a trap is going to be a tough process as well, which is why so many people turn to the aid of local wildlife control companies and professionals to ensure the job is done both legally, and properly – keeping the animal safe, and releasing it to a new home suitable for it to live in, plus far enough away to keep it from coming back. Armadillo trapping takes some knowledge – this animal is not going to be like a rat or squirrel; animals that are somewhat easily trapped. It is going to take a little bit more hard work with this creature, which is why the best idea is to call a wildlife specialist to remove the armored pest from your property. If you are adamant that you want to do this on your own, you are going to need education! 1. Is it actually legal to catch and release an armadillo in your state? This is very important as in some states, this is actually illegal and you are going to need wildlife control to deal with the problem for you. You can find information online, or check with local game regulations from authorities for more details. 2. You are going to need a rather large trap! They weigh up to seventeen pounds, which is a lot! You are going to need a big enough trap to catch the not so little critter, and a trap that is going to be durable enough to contain it, and then carry it to its new destination. 3. You are going to need a walkway to the trap. It has been said that creating barriers made of wood with tempting treats all the way down it works best, and above all, you are going to need a lot of patience. Armadillo trapping is hard work – don’t say we didn’t tell you so! 4. Bait is important. Thankfully, they like a lot of food including fish, fruit that is overripe, rotting or spoiled meat, sardines, meal worms, and even maggots. This is not a good selection really – you should probably think about a wildlife control professional! 5. When you release the armadillo back into the wild, you will again have to check with the local authorities on their rules and regulations, but as a generalized rule, you are going to need to release it around two miles away from your home to prevent it from coming back. The trap needs to be big. By big, we mean up to seventeen pounds in weight big. This creature can grow to a rather large size and the trap will need to accommodate it, otherwise it will be useless. You will also need to make sure that you are going to be able to carry both the trap and the armadillo – you will need to relocate it, at least two miles away from your home, once you have caught it. Check regulations and rules around your state however – in some states it is illegal to do this. An armadillo is not a creature that will be trapped with ease, I’m afraid. It is going to take persistence and knowledge. You are going to need to build a walkway of sorts leading the armadillo to the trap. One made out of wooden barriers has proven to be the best. You will also consider the need to line the route with bait, such as maggots, meal worm, spoiled meat and fruit, and even fish if you have some handy, but the truth is that these don't work very well, if at all. Read more about Armadillo Bait here. When you set the armadillo free, you will need to check its natural habitat, and also if it is legal to do so, in order to make sure the animal thrives where you set it. Ideally, you are going to want to travel at least a couple of miles away from your home to make sure that it doesn’t come back with a vengeance, but if you are in any doubt, you can always call on the local wildlife protection companies to remove the creature for you. 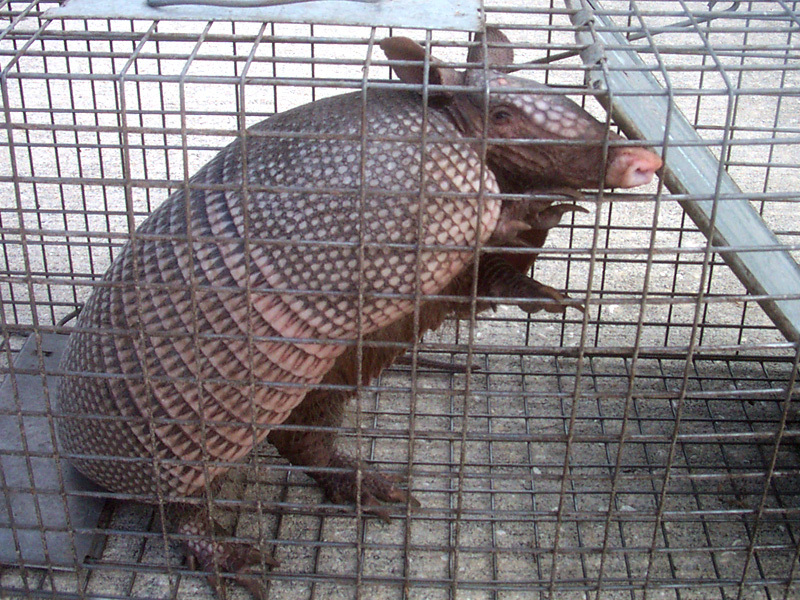 Go back to the main Armadillo Removal page for more information about armadillo trapping. The armadillo loves to eat grubs and bugs, so eliminating their food sources are not the way forward when it comes to trying to get rid of one out of your yard. They love fish, especially freshwater fish, as well as berries, wasps, (this can’t be a bad thing!) beetles, and even caterpillars. Did you know that there were actually over twenty different species of the friendly armadillo? Did you also know that actually, only one of these species is found in the USA – the nine-banded species? Usually, you will find these odd looking creatures in hotter places as they detest the cold weather, and especially frost, with a passion! The Gulf Coast and Texas is where you will usually find the armadillo, and you are likely to come across the awful holes they dig before you come across the animal itself, especially during the summer where it is nocturnal. These creatures only come out during the daytime in the colder, winter months. Have you ever seen an armadillo? Unless you live in the Gulf coasts or Texas, the answer to that question will probably be a no. This is even more so the case when you consider that they only come out during the day in the colder winter months because they cannot stand the cold temperatures. During the summer months, they tend to be nocturnal, so you are more likely to come across holes that this creature has dug in your yard, rather than the armadillo itself. When you try to prevent an animal from coming onto your property, you usually try to kill out the food source first, but with the armadillo, this can be quite hard work, especially when you consider that their main sources of food are the things that are naturally present in your yard – wasps, beetles, caterpillars, freshwater fish and even fruit if you have this growing.